I’ve been getting my army list ready for the next round of the Northern DBMM Double League on Sunday, April 19th at Walkden. I needed to add an extra 50 points to my regular 400 point army and I began to consider how best to assign baggage to a four command army. The choices are many with 0-2 elements per command and the options involving army and command baggage (more details). After I’d finished my list I realised that there are situations where command baggage is better than army baggage and visa versa but I couldn’t put my finger on just where. Command Baggage - 4 pieces from two commands adds 4 MEs (2 x 2) to both commands; so 8 MEs in total. Army Baggage (Plain)– 4 pieces from two commands adds 2 MEs (4 x 0.5) to both commands so 4 MEs in total. 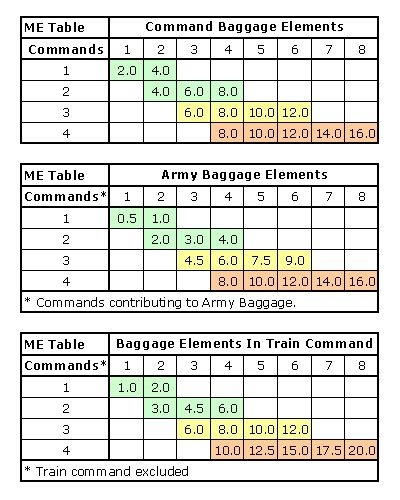 Army Baggage (Train Command) - 4 pieces from two commands adds 2 MEs (4 x 0.5) to both commands plus 2 MEs (4 x 0.5) to the Train command; so 6 MEs in total. For 1 or 2 commands (in green) command baggage adds more MEs to both the army and to the contributing commands. For 3 commands (in yellow) the contribution to the army is the the same but command baggage adds more MEs to commands with baggage. For 4 commands (in orange) a train command adds more MEs to the army and the same as command baggage adds to commands with baggage. Looking at the tables, the real choice is between command baggage or army baggage in a train command. Plain army baggage (that is not in a train command) does smooth baggage MEs across contributing commands but it is only really viable as an alternative to command baggage with 4 commands and 5-7 baggage elements. For 1-3 commands it is significantly worse with the lower “ME effectiveness” easily outweighing any potential tactical advantages that might arise. There’s a 4 element minimum for all commands in DBMM (Page 14, paragraph 1). This means that if you choose to have less than 4 baggage elements you can’t have a separate train command unless you add enough artillery or war wagons to bring the total number of elements to 4. Allied commands can’t contribute to Army baggage and Allied commands of less than 10 elements may only contain one baggage element (from DBMM Army Lists). This analysis has simplified the way I add baggage to my armies which are usually 3 or 4 commands. If I need to strengthen commands to increase break points then I’ll consider command baggage first. If I feel that command baggage will be too vulnerable then I know what it will cost me to switch to army baggage in a train command. There are lots of other things associated with baggage commands, like fortifications, which will alter this balance but I think this is a good start and I hope you find this useful. A Train command baggage gets its own extra PIP dice to move (if mobile). This is a free benefit that can be useful; especially with Bge (F). The extra ME contributed by a Train command are not deducted from the army ME when a benefiting command breaks. This means that the loss of your combat commands is less painful; as long as you keep the train command safe. The flip side of  is that losing a couple of Baggage elements from a Train command is usually enough to break it and inflict large ME losses on all commands and hence your army. A very minor consideration is that the extra PIP die granted to a Train command makes weather effects less likely and I'd certainly consider this for a "shooty" army.